Walter John Abbott was born in Yeovil in 1875, the son of leather parer Melbro Parker Abbott and his glover wife Ellen. In the 1881 census Melbro and Ellen were living at 21 Reckleford with their children; Arthur aged 10, Frank aged 7, Walter aged 5, Kate Rose aged 3 and one-year old Minnie. By 1891 the family had moved to newly-built 2 Camborne Street and had a new son, William. 15-year old Walter gave his occupation as a glover leather parer like his father. Walter enlisted in the Army around 1898 although confusingly much of his early service was, for reasons unknown, served under the name of Carter (and there were too many servicemen called Walter Carter to determine one from another). In the spring of 1907, at Yeovil, he married Ada Elvina Smith and they were to have five children, including; Ivy May (b 1903), Katie Elvina (b 1909), Doris Lillian (b 1910) and Walter Frank (b 1910). In the 1911 census the family were living at 2 Sawyers Place, Cold Brompton, Gillingham, Kent. Walter gave his occupation as a Private in the Royal Marine Light Infantry. The family later moved back to Yeovil and lived at 39 Queen Street. So, certainly by 1911 he had re-enlisted or was transferred to the Royal Marine Light Infantry (Service No CH/11391) and is known to have served aboard HMS Humber. HMS Humber was a Humber-class monitor (a class of relatively small warship which was neither fast nor strongly armoured but carried disproportionately large guns) of the Royal Navy. Originally built by Vickers for Brazil as the Javary, she was purchased by the Royal Navy in 1914 on the outbreak of the First World War along with her sister ships Severn and Mersey. Humber took part in operations along the Belgian coast between October and November 1914. In March 1915, she was towed to Malta, and arrived off Gallipoli in June. Walter saw action in the Gallipoli Campaign in the Dardanelles. In early 1915, attempting to seize a strategic advantage by capturing Constantinople, the British authorised an attack on the peninsula. The first troops landed on 25 April 1915. After eight months of heavy fighting, the troops were withdrawn around the end of the year. 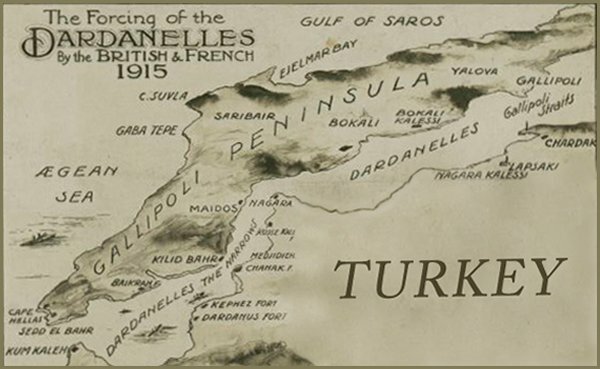 The campaign was one of the greatest Ottoman victories during the war and is considered a major Allied failure. Following the defeat, HMS Humber moved to Egyptian waters. 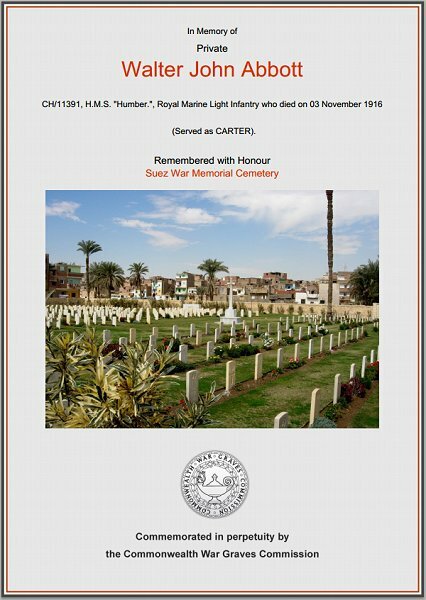 Walter, however, was accidentally killed while on leave in Suez on 3 November 1916. While chatting to friends in a railway carriage in the Rue Colmer Railway Station in Suez, Walter walked along the platform as the train departed. Unfortunately he slipped and fell under the train, being killed immediately. On 5 January 1917 the Western Gazette reported "Mrs Abbott of 39 Queen Street, who a short time ago was informed that her husband, Private J. Abbott of the R.M.L.I. was killed by a train, has received the following letter from the Admiralty: “We have to inform you that according to a detailed report now received, his death was caused by being run over by a railway train in the Rue Colmar Railway Station, Suez, on 3rd November. It appears that on the evening of that day the deceased, who was on leave at the time, stood on the platform talking to some soldiers who were in a compartment. On the train moving out of the station he followed it along the platform, and before he was aware that he had reached the end fell down on the rails. Life was extinct before any assistance could be rendered, and he was buried in the Military Burial Ground at Suez.” The deceased soldier had served 18 years in the service, and had seen active service in the Dardanelles. He leaves a widow and five children, with whom the greatest sympathy is felt." Walter Abbott was buried in the Suez War Memorial Cemetery, Grave B.36 and his name is on the Yeovil War Memorial in the Borough. The Commonwealth War Graves Commission certificate in memory of Walter Abbott.